The IT and IT Enabled Services (ITES) industries have been one of the key driving forces fuelling India’s economic growth, contributing about 8% to India’s GDP in 2017. The IT share in the country’s total service exports amounts to more than 45%. 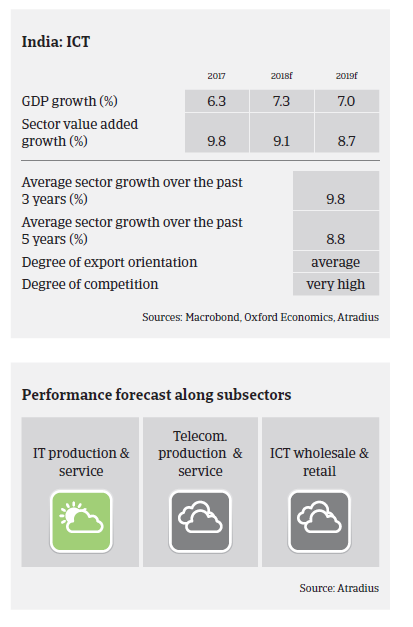 In 2018 the ICT sector is expected to grow 9.1%. In an international comparison of ICT markets, India continues to lead in terms of growth rates. Key growth drivers are improving economic indicators, growing disposable income, penetration into rural markets, tier 2 and tier 3 cities, online and digital marketing, the e-commerce boom and government investments in the industry. However, despite the robust growth rates, the industry continues to be characterised by stiff competition and cheap imports causing pricing pressures, especially for smaller IT resellers and distributors who are working on very low margins. On average, payments in the Indian ICT sector take around 90-120 days. The implementation of a nationwide Goods and Services Tax (GST) in July 2017 first created some ambiguity in the tax structure, leading to delays in sales and invoicing. However, despite administrative challenges which caused temporary cash flow issues, We expect no substantial increase in payment delays and insolvencies in 2018. For the telecommunication segment our underwriting stance is neutral. While mobile-phone penetration and internet usage are increasing, competition is fierce and prices are under pressure with little or no product differentiation. We are also neutral with the ICT distribution and retail segment, as this sector comprises many small businesses (mostly proprietorship/partnership companies) and is characterised by fierce competition and price pressure. Many players hold only a moderate financial risk profile, i.e. stretched liquidity and thin margins with limited or no value addition.